The concept of a society in which girls are forced into polygamous marriages may not be everyone’s idea of a good time, but I like art that pushes boundaries or attempts to explore unusual subjects in a meaningful way. 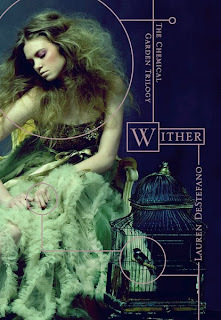 Besides, the cover is gorgeous! 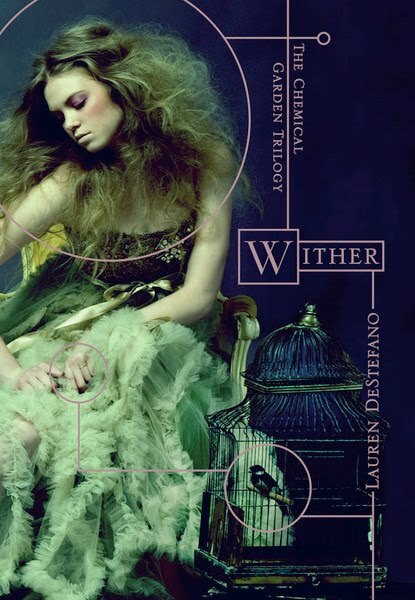 And on the set decoration front, Wither is a novel that seductively beckons the reader with alluring images and positively drips with atmosphere. Languid young women wander around a mansion in lacy gowns waiting to be impregnated by their joint husband, due to drastically shortened life spans that force them into polygamous marriages. It’s pretty much the love child of Ally Condie’s Matched and the television show Big Love, as styled by Vogue. While many of the scenarios and language are certainly quite beautiful, however, sometimes I wasn’t sure whether I should laugh at the repeated images of our heroine lounging on a satin bedspread eating candy, all while she’s supposedly upset over the situation she’s in. There’s also a strange lack of internal dialogue and emotional distance that make it difficult to empathize with Rhine, and very few scenes that come close to evoking the horror that lies beneath the beautiful exterior of the pampered world in which she lives. This whole concept just seems like a weird one for YA literature, too. In order for the icky factors of child brides (one of them is only 13), kidnappings, forced marriages, fixation on impregnation, murder, medical experimentations, and so on to be successful, they needed to be overridden by solid world-building, strong characters, and emotional depth. Unfortunately, the whys and wherefores of how society has disintegrated into this is never really explained, and as a result most of set-up for this world seems fairly ludicrous. The questions that were raised in my mind were also never really answered, nor the characters adequately developed. There are surface attempts to create relationships between Rhine and Linden and between the sister wives, but none of them seemed very real or compelling to me–and Rhine’s interest in Gabriel seems due to proximity more than anything else. How can people live this closely together for so long and know next to nothing about one another? But is there really anything under the surface at all? After spending 358 pages with Rhine, I still don’t feel as though I really know who she is or why people are drawn to her, except that they’re supposed to be. It also strains credulity that a healthy young man would chastely lie in bed with her for over 10 months and never consummate the marriage. Overall, this novel just needed more tension, more anguish, more depth, and more feeling. By the time Rhine finally takes some action, I was fairly impatient with how long it had taken the story took to get there, as well as annoyed by how little information was revealed. I’m also disappointed in the missed opportunity to explore the unusual dynamic of a polygamous relationship, which was one of the weakest aspects of the book. I’m curious to see where the story goes, however, so I’ll probably pick up the next installment in the series. But I’m crossing my fingers that the beauty of the language and imagery will also be matched by more intricate plotting and more genuine emotion. 30-second synopsis: contains disturbing (though non-explicit) concepts suitable for older teens and adults, as well as a yet-unproven heroine.